#9: Top of their field; where business and squash overlap. Jen Gabler & Katline Cauwels reveal their thoughts. Through a collaborative effort Jen & Katline Teamed up to design a program targeted for young female players to achieve excellence. How you push yourself to achieve excellence on court, can have direct application off court as well! Resides in the NY/CT area is the Co-Founder of The Refinery which runs accelerator programs & pitch competitions for Women Tech Entrepreneurs aimed at fueling their success. Jen’s background has been steeped in the business world, usually applying (deploying) her skills as a CFO, Chief Financial Officer, to help grow those companies as part of the leadership. Jen attend Dartmouth for undergrad and then went onto Columbia for Business School. Go check out http://therefineryct.com/ to learn more about all the amazing work they are doing for Women in tech. Resides in the NY/CT area and is the co-founder of M Squash Academy, which she founded with her husband. Katline is originally from Belgium, who pursed the top of the Game as Junior becoming the No. 1 Junior ranked player in Europe and cracked the Top 50 on the Professional Tour. Katline pushed herself not only on court but also earned two Masters degrees in Business and Communications respectively… while touring! Go to www.msquash.com to learn more about how to take your game to the next level! #8: Curious about College Squash & Ivy League recruiting? 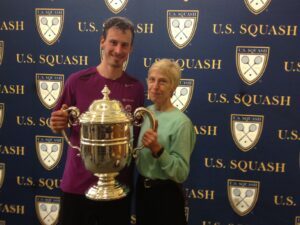 Jack Wyant (Penn Head Squash Coach) shares his insights & more! In this episode, we talk shop with Jack Wyant who is the Head Coach of the Women’s Squash Team and Director of Squash at the University of Pennsylvania. Wyant recently wrapped up his 13th season coaching at Penn Athletics and led his Team to back-to-back 2nd place finishes at the Collegiate Championships. Jack is an experienced player himself, competing at the highest level in the Junior & College (Princeton University grad) ranks racking up National Championships at both levels. Wyant has also played for Team USA on Junior and Senior Teams but as a Coach led the U.S. Junior Girls to historic heights, earning a 2nd place finish at the 2011 World Junior Team Championships. In our conversation, we focus on College Squash, talking through the recent milestone announcement to officially dissolve the current separate men’s and women’s associations and form a newly merged organization in partnership with US SQUASH but also spend a lot of time learning more about Penn Athletics and his squash program. We both thoroughly enjoyed bringing you this episode and look forward to having Jack on again as a future guest. Enjoy! Based on the current feedback, more of our listeners are leaning towards the extended version which is why we’ve only released one version of this episode. If you have a different opinion, please let us know via email squashradio@gmail.com. As always, thanks for listening! Follow us on social media accounts for all the latest news or www.squashradio.com. #7 Extended: Author, Journalist, Master of Ceremonies & Coach…Alan Thatcher knows all levels of the Sport & shares it all! In our conversation, we cover a range of topics from a behind the scenes look at writing his most recent book as well as his role with the Canary Wharf Professional Squash Tournament. But also get into the weeds about his grass roots efforts of growing the sport and some key factors that could truly help sharing the sport we all love. We both thoroughly enjoyed this conversation and hope you do too! Published by Pitch and available on Amazon and Kindle. PSA World Tour $10k event at The Mote Squash Club, Maidstone, Kent from June 11-18. #5 Extended: Former Stanford Coach, Richard Elliott, with over 30yrs of Coaching experience shares his wealth of knowledge on squash & life as he embarks on a new venture! In this epi sode, we talk with Richard Elliott, who was the former Coach at Stanford University who’s women squash program has developed into a National Top 10 ranked program but Richard was there from the beginning when it all started. Richard has been instrumental in the growth of squash on the West Coast, he shares his experiences and perspective on the growth of squash at the Junior and College level. Although we dive in deep about coaching, so many of these philosophy’s and principles apply towards life in general. Squash Radio is bringing the ‘inside’ of squash to life by serving up the best stories from Squash World. Today we sit down with Christopher Gordon, a New York City native, and talk about his career on the Professional Squash Tour (PSA) to share his experiences as a Top 50 ranked tour player. Gordon has distinguished himself as one of the most decorated Team USA members for squash, with five World Team Championships, three Pan-Am Games, two World Games Championships, two World Junior Championships & a handful of Pan-Am Fed Cup Championships. In addition, 2013 marked the end of the Julian Illingworth’s eight year winning streak when Gordon raised the trophy for himself to become the U.S. Champion. Beyond his amazing on court performances & results, Christopher has been a tremendous ambassador for the sport of Squash. He has done countless exhibitions all across the U.S. & World, has been a commentator for PSA Squash TV & emceed the Delaware Investments U.S. Open.